Assorted flavors at Gelato Bar in Los Feliz. 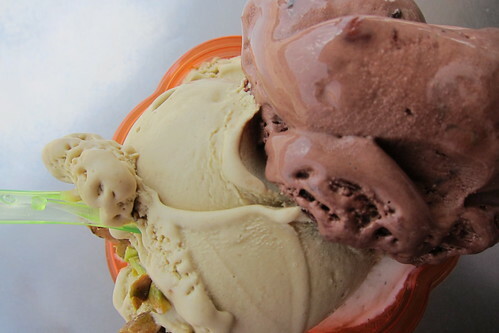 Yesterday, we listed the 5 Best Ice Cream Shops in Los Angeles. Today, we move onto gelato. Taxonomy is crucial in these matters. : It's all about the chocolate gelato at Pazzo. This small shop near Sunset Junction makes incredible, creamy gelato that's densely flavored and soft as silk. We're suckers for all of Pazzo's chocolate varietals, whether it's plain, dark and made with copious amounts of Valrhona, spiked with cayenne or mellowed with toasted almonds. 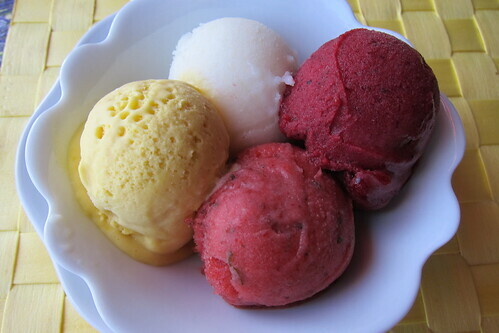 The flavors range from primal and earthy (like a chevre and sour cherry so intense it might have come directly from the dam's teat), to note-perfect classics (like mango, pistachio and banana) to surprising, and surprisingly good, mash-ups like pineapple celery sorbet. : This is gelato at its finest: soft, velvet smooth and reeking of casual indulgence. Grom, a much loved Italian chain, prides itself on using superlative ingredients and the dossiers that come with them: pistachios from Syria, nougat from Piedmont, chocolate from Colombia, almond chips from Sicily. "Exquisite" is probably among the top Words That Food Writers Should Not Use, but there's no other way to describe Grom's melon gelato, replete with the essence of cantaloupe. The apricot sorbet is as colorful as a California poppy and twice as flavorful. Every fruit sorbet tastes like it was plucked from the earth and rushed straight to the mixer. Among the 20 or so flavors, which change seasonally, are gelato standards like baccio, stracciatella and tiramisu as well as less common flavors (at least in the United States) like liquirizia (licorice) and torroncino (nougat). 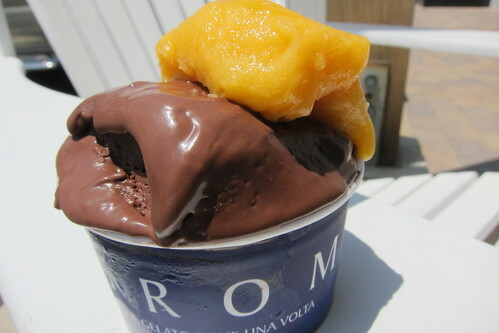 Grom's dark chocolate gelato, called cioccolato extranoir, is an unstoppable exultation of cacao, so dark that if it was a movie, it would make Lars von Trier's ouevre look like slapstick comedy. : Everything Delicieuse does, they do with care and formidable attention to detail. 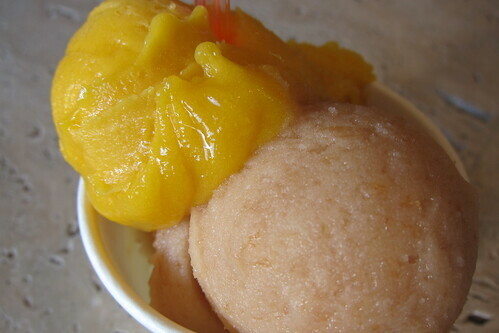 Nowhere is this clearer than in their fruit sorbets, a wallop of scent, flavor and freshness. The strawberry basil is perfectly balanced on all counts. Their Pear William is exceptional, and the Berry Michelle, a mix of strawberries, raspberries, blueberries and blackberries, may be the best berry sorbet ever. The gelato is also pretty terrific. The chocolate is dark and bitter, the coconut, creamy and supple, and the lavender goat's milk, which could have easily tasted like a potpourri sachet, has just enough of the herb to earn its name, Summer in Provence. Deliceuse's skill is both deep and broad. 12 flavors are available in the shop at any time, but the repertoire includes dozens more, like avocado sorbet, maple sugar goat's milk, cognac, banana flambee, white peach, Earl Grey, saffron and fig. Delicieuse makes gelato, whatever its provenance, that's so outstanding it's worth a brutal drive down the 405.
: There's a reason Bulgarini Gelato is a perennial topper on Best Gelato lists. While other gelaterias do a superb job of capturing the essence of a particular flavor, Bulgarini somehow captures the flavor itself. Case Study: their pistachio gelato, which tastes like an entire grove of trees has been crushed and condensed into a single, aromatic, golf ball sized scoop. Husband and wife team Leo Bulgarini and Elizabeth Foldi make it the old fashioned way. They don't skimp on the dairy, using milk from Broguiere's Dairy in Montebello. They rigorously source the fruits, nuts and other flavorings that go into their gelato, which brings us back to the pistachios, imported from Bronte, a Sicilian town near Mount Etna. Everything, without qualification, at Bulgarini is excellent -- a floral, mellow yellow peach vs. a deeper, more concentrated white peach; banana so creamy it might be butter; intensely fragrant mango sorbet. It's dense, velvety, earthy and without parallel in the city of L.A. Honorable Mention: Al Gelato (Beverly Hills), GelatoVino (Hollywood), Paciugo Gelato (Manhattan Beach, Thousand Oaks), Scoops (East Hollywood), Scoops Westside (West L.A.).